Build your own sports empire. 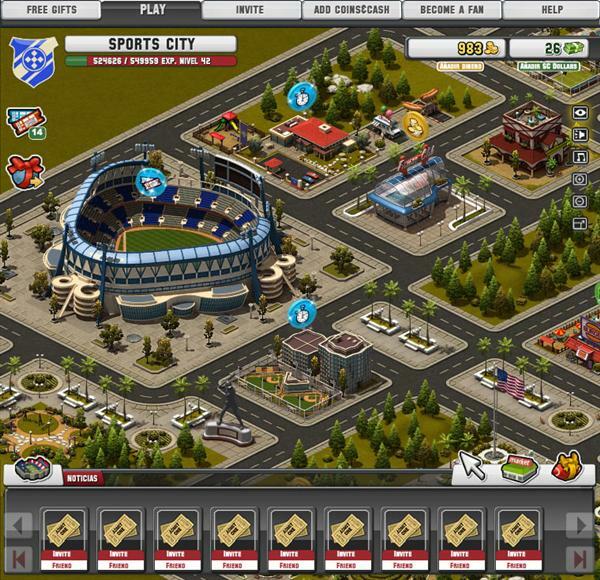 Play Sports City on Facebook or Tuenti and become the world’s best business person and sports director. 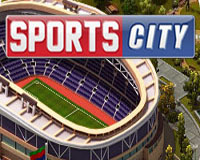 In Sports City you create your own stadium, manage teams in different sporting disciplines and make it to the top of the world ranking, setting up elite training facilities, youth teams, shops, members’ clubs, transport networks… Everything you need for the best sports club. As a sports director, you’ll have to achieve the best possible return. How? By hiring the best professionals in the market, directly training your teams and obtaining the best results in the matches played. The more fans you can recruit in each sport, the more progress you’ll make as an entrepreneur and team manager. 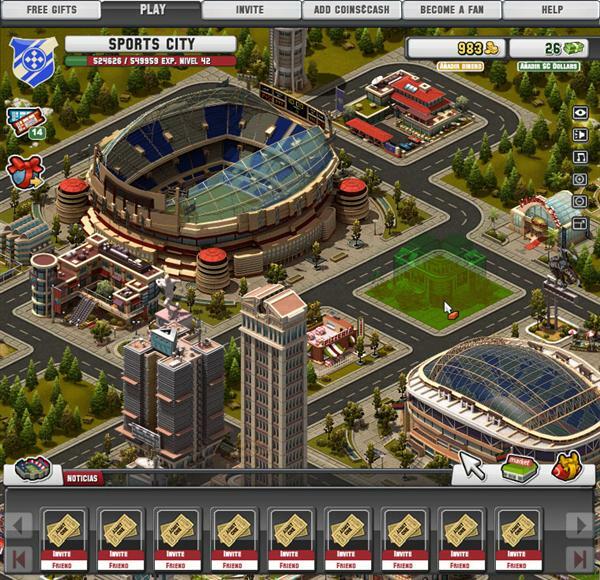 With Sports City you can manage your own tactics to get the best players in the market and become a guru of sports and strategy. The first sport is free to build. From the second sport, you will need the help of 4 of your friends who hold the managerial positions of your sport. You can also unlock this feature early by purchasing it with SC Dollars. To expand your city you have to access the Shop and choose the Tab called “Land expansions”. Here is where you will find all amplification options. You can expand your city with the help of your neighbors or by paying with SC Dollars. 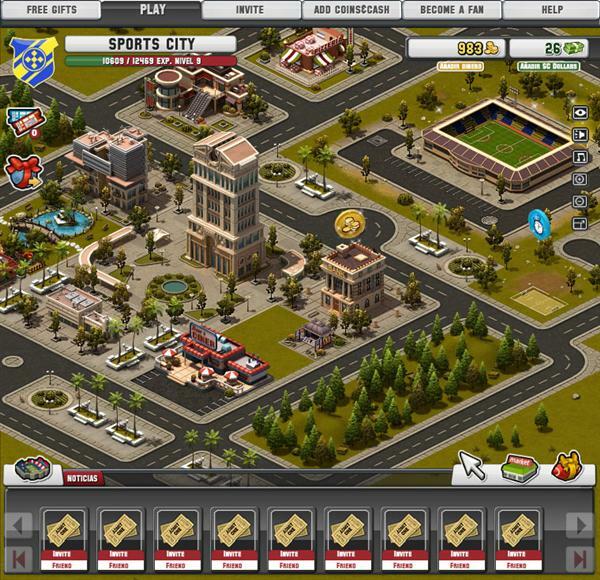 The city level is indicated in the upper part of the screen and shows your city progress. This will enable you to compare your performance with other players and friends to see who has made the most progress in Sports City. The city level rises depending on the number of matches you play by accumulating XP (experience). You can also reach a higher level by visiting your neighbors frequently and supporting them in their sports. By playing matches. You will receive points only for playing matches, and even more if you win them! By carrying out work in the Financial District or in the Marketing Building as well as in the shops or in the Member´s Club of each sport. Choose the work you carry out depending on how much time and money you have. By building the Service Buildings available and by keeping them updated. If you enter the game on a regular basis, we will reward your loyalty by giving you more points if you play on a daily basis. By visiting your friends and supporting them regularly in their sports. The level you have in your city and the level you have in your sport are different things. The level you have in a sport is shown in the division you are in and indicates the progress you have made in each sport. The division can be seen in the upper part of the Manager screen when you are playing a match. In every sport, each of your team members has a performance that will be spent when playing matches. When you finish playing a league, you can refill the performance of your team in the Sports Center. You can also raise your performance on the screen prior to a match. You will see that on the lower part of the screen a button with a muscle and an arrow pointing upwards. For 2 SC Dollars you will be able to refill your performance automatically up to the top. 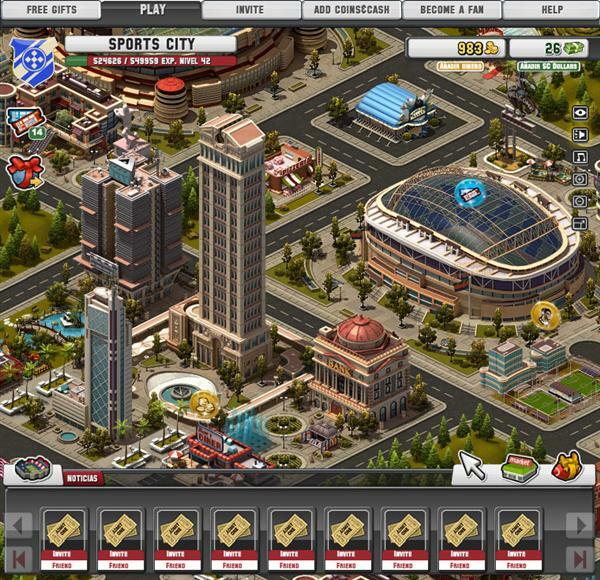 Building the Training Center you will not only be able to refill the performance of your team, when finishing a league, you will also be able to raise the maximum performance of your team. It is essential to always have your teams well trained. In order to raise the average of your team there are better players at the Youth Academy you can hire. You can also raise it by buying Booster Packs in the Shop. The players you will be able to acquire are Standard, Bronze, Silver and Gold. The bench is used to carry out all the essential moves among the players in the team. When you buy a new player, either your talent scout has found him, or you have trained up a young player from your youth squad; this player will always go direct to the bench. You can replace players by those on the bench and vice versa from the manager screen. You will always have to go via the bench first to improve or sell an existing player, and you can then manage him in the Sports Market. The tickets enable you to play matches, and you use a ticket each time you play a match. You can play matches in any of the sports you have built provided you have tickets available. As a present of your friends. You can see it in their publications. As a bonus when reaching a higher city level. By winning a league and getting to a higher level. You can challenge your friends by inviting them to a match in a sport you have in common. The advantage of the challenges is that you can obtain XP in a simple manner and without having to spend a ticket to play. In the “service” section of your stadium you can find the Tactics Center. You will there find Tactic Cards that will help you strengthen your team. There are Standard, Bronze, Silver and Gold Tactic Cards. Maintaining your Tactics Center on a high level you are more likely to get better tactics. Each sport is managed separately and part of the profits are pooled. Your progress as a player will earn you the option of updating your buildings, if you so wish. Any profit you generate accumulates as cash. Choose from among friends and other users to play your matches against. Related Tags: city building, iZ Social, Management, sports.